Get to know your antique porcelain collectibles by learning to recognise Staffordshire porcelain. Most people have probably heard of Staffordshire Porcelain, and most vintage and antique porcelain collectors are probably familiar with the name. But, just what does Staffordshire mean when you’re talking about pottery & porcelain? Is it a company name? Is it a style, or type of porcelain? Is it just a region that porcelain comes from? Or could the answer be all of the above? This is information every keen porcelain collector should know. Staffordshire porcelain is essentially all the above. There is a noted porcelain company named Crown Staffordshire, and Staffordshire is a region that was, (and still is), home to many English porcelain makers. It is also a type of porcelain which was known as salt-glazed, or creamware porcelain, but these aren’t the only types produced there. And it is also associated with a style of porcelain design – Blue Ware was a porcelain design that originated in Staffordshire. So yes, the answer is that Staffordshire porcelain is all the above, and most collectors of Staffordshire antique porcelain know that this is a very broad category, so they almost always focus their collections on one aspect of Staffordshire porcelain. The Origins of Porcelain in Staffordshire. As a region, Staffordshire became the hub for many English porcelain makers and manufactories because of its close proximity to the source of Devonshire clay, a prime ingredient in the formula for most types of English porcelain. Its location was also central to major water and land transports of the time, which is another important consideration when deciding where to establish a manufacturing facility. And then there is also the small detail that it just happened to be the region where the first potteries started in the early 1700’s, and grew into an industry from that first seed or two. English porcelain was a mix of several types of porcelain, and with the diversity of potteries and porcelain makers in Staffordshire it is no wonder that recognized Staffordshire pieces can be any one of many varieties. The Staffordshire Pottery was predicted to sell for £70,000 but high demand pushed the hammer price to £107,000. The majority of the collection dated to the mid-19th century and comprised Staffordshire Figures which are primarily of animals and famous people. Some pieces, however, were as early as the 1770’s and other pieces dated to the early 1900’s. Early English porcelain was a basic tin-glazed formulation called Delftware. As porcelain makers began using the Devonshire white clay their porcelain formulations became known as soft-paste or salt-glazed porcelain. This process produced a sturdy utilitarian type of porcelain and was the predominate output for many years. As porcelain makers worked to improve their formulas, a new combination using bone ash was discovered. This led to the production of a porcelain called bone-china, which was harder and more elegant looking, and more like the revered Chinese porcelain that set the standards for fine porcelain. Even the name, bone-china, references it’s similarity to Chinese porcelain, and bone-china remains the type of porcelain most associated with Staffordshire today. With so many porcelain makers in the Staffordshire region, it’s not hard to understand why there were so many design styles associated with the Staffordshire name. Probably the most recognized Staffordshire porcelain would be Blue Ware or Flow Blue Porcelain as pictured above, (although Flow Blue is more a process than a type of porcelain). The English porcelain industry was reaching its peak in Staffordshire as porcelain makers were discovering the benefits of a cobalt coloring they were using. Cobalt blue worked so well on the porous surface of unfinished porcelain pieces during the design transfer process, that the flow of the color actually helped hide some of the imperfections that naturally occur in early porcelain production. Porcelain makers loved Flow Blue. This was also about the same time the American market was opening, and many of the Staffordshire manufactories were producing porcelain directed at this new American market. 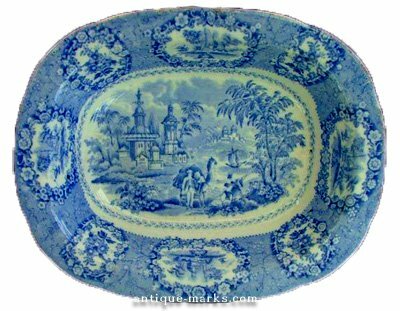 Due to their enthusiasm for the new cobalt blue coloring, even though the scenes and designs were different, the majority of porcelain pieces produced for this market used cobalt blues as the main colors, hence the name Blue Ware. The list of porcelain potteries from the Staffordshire region includes many well recognized names in the world of vintage porcelain collectibles. The one company that retains the Staffordshire name is Crown Staffordshire Porcelain, which started as the Thomas Greene China Co. in 1833. Using bone-china porcelain, in 1887 they began producing a fine line of Staffordshire dinnerware under the new name of Crown Staffordshire China. Spode – Early production included creamware, pearlware and blue-printed earthenware. Royal Worcester – possibly the finest producer of finely crafted blue transferware Staffordshire China. One of the most successful potteries ever to originate in Staffordshire. Either through the invention of new processes and formulas or through their hallmarks of craftsmanship and design. It was their efforts to refine their processes or perfect their craft that place them among the most desired porcelain collectibles around today. A common potters mark or symbol can be found on large quantities of Staffordshire pottery & porcelain. The Staffordshire knot mark, as it is known, consists of a three loop knot constructed from a length of rope. Often with a set of initials within the knot loops and sometimes a crown above the knot. The knot has been used by Staffordshire potters for over a hundred years and can still be found on a wide variety of Staffordshire pottery. There are various stories of how the Staffordshire knot came to be; One states that a local Sheriff devised the knot to cut costs by allowing three criminals to be hanged with a single rope. Hard to imagine but England has lived through some barbaric times. However, the earliest verified appearance of the Staffordshire Knot is on a seal in the British Museum. The seal was the property of Joan, Lady of Wake, who died in 1443. The Lady of Wake’s possessions passed to her nephew Humphrey, Earl of Stafford, who adopted the Knot of Rope as his badge prior to taking the post of Duke of Buckingham in 1444. The Duke of Buckingham and his descendants then used the Staffordshire Knot as a personal cognizance. However it wasn’t part of their armorial bearings, but rather a badge they gave to their servants and retainers as a livery and form of recognition. The townsmen of Stafford who were leigemen of the Stafford family, also used the knot. As the English feudal system fell away and civil liberties grew, the knot was gradually adopted by the Citizens, Freemen and Burgesses of Stafford and was eventually included in the Staffordshire Borough Coat of Arms. So, as you can see, the name Staffordshire can represent many areas in antique porcelain collecting. But whether you pick a Staffordshire piece because you think it is pretty. 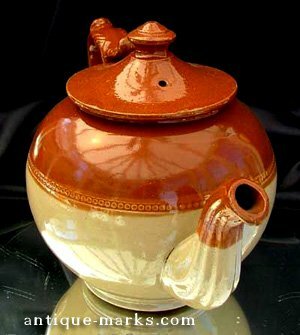 Or your collection focuses on a particular pottery or porcelain manufacturer. 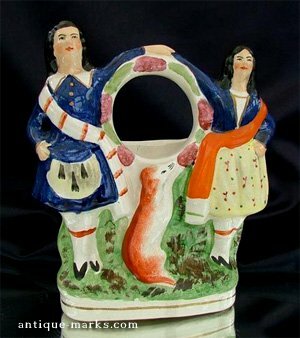 Or you collect a certain style of porcelain or focus on vases, figurines, plates, plaques or another particular form. Staffordshire porcelain will always provide plenty of choice pieces for you to choose from. Tip! The choices provided by Staffordshire antique porcelain can be as varied as the interests of any individual porcelain collector. Be sure to focus your attention on good quality and rarity within a specific section of Staffordshire porcelain or you could find yourself with a real mixture.